I was looking forward to this release having been a fan of the comics since they first started. 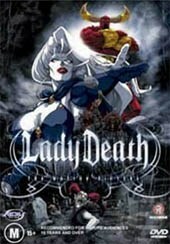 Created by Brian Pulido and Steven Hughes, Lady Death tells the tale of young Swedish girl Hope and her father Matthias and their tale of a journey to Hell and a story of redemption through Death itself. Whilst the story itself is pretty tight, it’s the animation that I found to be lacking a bit of the detail and glorious colour that we are used to seeing in the comics. It all seemed a bit washed out and the general detail whilst passable just didn’t hold up to what we would commonly see in a Madman Anime release. You see, part of the problem for poor Hope is that her daddy is the prince of darkness, Lucifer and he has tricked her into condemning her soul to Hell. Thirsting for revenge, Hope becomes Lady Death and in what is an amazing short time too as she learns to swing a sword and come to terms with the powers that being the daughter of Lucifer gives to you. The audio and video from this release are okay, surprisingly though it’s the video that does let us down a tad considering that the movie is a 2004 release, it’s very shuddering in some scenes and reminds me a bit of a Flash animation streaming off the internet. Which I can assure you is not the intent. Extras are there for the fanboys and girls out there with a couple of featurettes and a director’s commentary. I would have liked some more info on the comic series too, especially more of a coverage of Steven Hughes the artist who brought Lady Death to life. I’d say rent this one.